Many wonder what is it about Paris that leaves people mesmerized and anxious to go back. Some would say it is the cultural heritage of Paris that could never be duplicated. Others were swept off their feet by the French cuisine they couldn’t get enough of in Paris. There are also those people, especially couples, who just couldn’t stay immune to the intoxicating smell of romance floating in the air of Paris, through every little street and avenue. In fact, a great number of couples chose Paris – the city of love, as their dream location for an engagement, a wedding, or both, “for Paris is a moveable feast”, as Hemingway would refer to it, and the sensation it triggers stays with you forever. Many visitors have confessed that Paris is not a city you can leave without making memories for a lifetime and a strong fascination which never fades, but only grows even bigger every time you come back (and the return is definite). One of the attractions of Paris that simply have to cause absolute amazement is the world-famous Eiffel Tower – the unprecedented symbol of the French capital. It is precisely the Eiffel Tower that has witnessed thousands of couples declare their love for each other in Paris, as it was the starting point of their future together. When envisioning a perfect location, many romantics go to Paris (at least in their minds), enchanted by the smell of French croissants, cheese, and a bottle of the finest wine. Paris is undeniably the city which celebrates love all year round and doesn’t require a special occasion for it. Whenever you decide to go to Paris, you’ll be able to see couples wandering the streets of Paris, inhaling its magic and truly enjoying every single moment. There are many ways to enjoy Paris, but those who have been lucky enough to witness its skyline have trouble finding anything more spectacular. 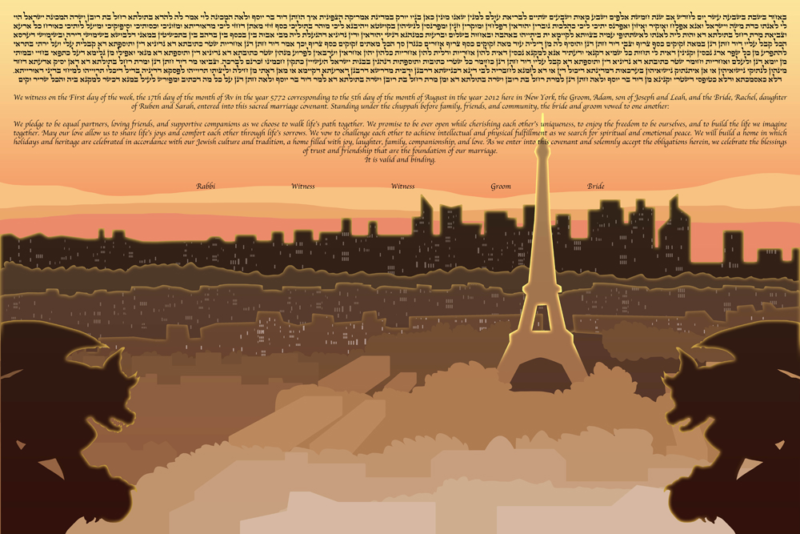 Our Paris Skyline ketubah portrays the landscape of Paris in the sunset sky, emphasizing its most prominent feature – the Eiffel Tower. The passionate love which can be felt only in Paris is the theme of our L’Amour Des Amantes ketubah, inspired by works of Henri de Toulouse-Lautrec, an artist who developed a deep connection with Paris and managed to vividly present its heart and soul. Whether you’re fascinated with the architecture, the history, or the fact that it has love written all over it, our Paris inspired ketubah designs will add the unique French sophistication to your ketubah, making it one of a kind.